the seller’s lawyer has a blood-stained eye. its mottled body writhing on the slab. All before we’ve even moved in. and replaced with virgin Romex. raising a blister as dark as a Concord grape. and under this roof that needs repairs. absorb our cries and take us in. "Determinedly affable, chatty and low-key even when his subjects are bleak, Harrison's fourth volume stakes almost everything on the winning tone that pushes his almost prose-like, free verse poems. Often that gamble succeeds: viewing Manhattan on New Year's Eve, 2000, Harrison (Feeding the Fire, 2001) muses, 'I wish I could give you/ this pale blue city under the glass/ of a plane window like a snowglobe,' the sweet wish barely ruffled by the specter of 9/11. 'Fork' recalls a decadeslong revenge against a malevolent writing teacher; 'To Kenneth Koch' elegizes a great one, while seasonal verse discusses baseball ('Sometimes this is all it takes, moving a pile/ of screened loam'). 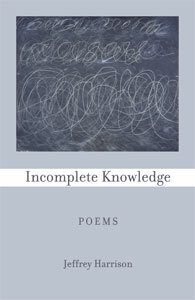 These lighter subjects lead up to weighty poems about the poet's brother's suicide and his grandmother's dementia, topics which together occupy perhaps a third of the volume, including the moving sequence 'An Undertaking,' which narrates the day-to-day aftermath of the brother's death. These memoirlike poems have the bizarre details real grief always includes (the brother had 'Enough socks/ for several lifetimes'), along with the sadness no verbal talent can assuage." (Oct.) Copyright © Reed Business Information, a division of Reed Elsevier Inc. All rights reserved.